School Technician wins sponsorship prize. Technician David Letham entered the raffle for sponsorship of Berwick Rangers and won first prize! 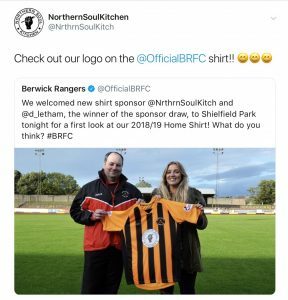 “Berwick Rangers are excited to confirm that Berwick-based Northern Soul Kitchen will be the primary shirt sponsor for the 2018/19 season. Northern Soul Kitchen are a community project on West Street, Berwick, turning unsold food into affordable and delicious meals for people. The food is offered on a Pay-As-You-Feel (PAYF) basis meaning people can pay what they think the food is worth, donate whatever amount they can afford or even volunteer their time and skills to pay for a meal – all have their value. Everyone knows that there is a nationwide problem with perfectly edible food being chucked away. Northern Soul Kitchen rescue this food before that happens and use it to make healthy meals for everyone. The kitchen will work to help a number of local issues, including food waste, food poverty, social exclusion and a misunderstanding about nutrition. As well as serving meals, Northern Soul Kitchen will be offering workshops and events for people to learn more about eating healthily on a budget.